Scott Lang is a petty burglar who prides himself on his skills at infiltration and stealing. Hank Pym is a genius scientist who has spent decades perfecting the technology needed to miniaturise living beings. When Pym's former business associate unlocks the secrets of Pym's researching in an attempt to create devastating weapons, he calls in Lang to take up the mantle of the Ant-Man. Ant-Man has a very interesting history. Back when British director Edgar Wright started making a name in Hollywood, after the success of Shaun of the Dead in 2004, he was tapped by Marvel to work for them on one of their properties. He chose the relatively obscure character of Ant-Man to build a movie around, perhaps figuring that his somewhat unorthodox filming style would get more leeway with a minor Marvel character than a big-hitter like the Hulk or Thor. When the Marvel Cinematic Universe took off, Wright's plan was put into motion and he and fellow Brit Joe Cornish were brought in to write the script, with Wright (whose cachet had increased in the meantime with Hot Fuzz and the multi-Marvel-actor-starring Scott Pilgrim vs. the World) to direct. For whatever reason, Marvel got cold feet at the last minute and decided to switch the film to a safer pair of hands, the up-and-comer Peyton Reed (why they didn't suggest Cornish, who'd become a hit director in the meantime himself with Attack the Block, remains unclear). It was a controversial decision and one that remains so, as the decision was made so late that Reed actually ended up still using Wright and Cornish's script. The result is a movie that has many of the hallmarks of an Edgar Wright movie, such as fast-moving action, kinetic dialogue and a fusion of humour and emotion, but lacks Wright's fantastic skills in editing and camera movement. Which isn't to say that Ant-Man is a bad movie at all. 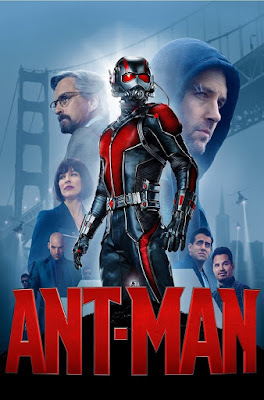 It's very solid, with a charming lead performance by the ever-reliable (and near-ageless) Paul Rudd as Scott Lang and effective support from Michael Douglas as Hank Pym, playing two different incarnations of Ant-Man. Evangeline Lilly also gives a great supporting performance as Hope van Dyne, Hank's semi-estranged daughter, although long-term Marvel fans may bristle at her more prominent Marvel character (aka the Wasp), one of the Avengers, being side-lined in favour of Ant-Man. Michael Pena also provides able comic back-up. The film moves really quickly and it eschews the Marvel tendency for insane scale by dialling things down to a more relatable level (the film's climactic battle takes place on a Thomas the Tank Engine toy railway track). The problems stem from the meta-knowledge that Wright would have probably made a crazier and more interesting film, and the actual film issue that it's villain is really poor. Corey Stoll is a very solid actor, but he is much better as the tortured protagonist or supporting good guy. As a villain he doesn't work at all, and his character has absolutely no layers. He starts off as a petty, evil, money-grabbing imbecile and remains that way through the film. There's no sense of the good guy he was once was when Pym made him his sidekick, and this hurts the film's arc. The secondary and tertiary cast also suffers from not having much to do. There's some absolutely fantastic actors here, like Judy Greer (Archer) and Wood Harris (The Wire) and they have such little material to work with they might as well be extras. I mean, why hire Avon Barksdale, even casting him against type as a cop, and then have him just standing around making surprised faces for every scene he's in? Ant-Man (***½) is a solid, fun, breezy flick. It's enjoyable and passes the time, but it's also a little forgettable. It's certainly not the worst film in the Marvel staple, but it does verge on being the most disposable. Ultimately it is worthwhile, for Rudd's charming lead performance, some good laughs, the relatively low scale of the action and the set-up work it does for Ant-Man's later appearances.